Bottom-of-the-table Sunderland rescued a point in stoppage time at the end of a thrilling game with Middlesbrough. Callum McManaman's 96th-minute strike ended a three-match losing streak for the battling Black Cats. Joel Asoro netted for Sunderland before Jake Clarke-Salter and Adama Traore were sent off in quick succession. Patrick Bamford and Grant Leadbitter put Boro ahead, only for Jonny Williams to level and Bamford grab what seemed to be the winner before the late goal. The draw ended a disruptive week for Sunderland after it was revealed that under-fire owner Ellis Short was prepared to give Sunderland away for free if someone could take on the club's substantial debts. The Black Cats - who finished bottom of the Premier League last season - are two points adrift at the bottom of the second tier and four points from safety, while Boro move up to seventh. Teenage striker Asoro poked the ball home early on to give Chris Coleman's under-fire side hope, but Chelsea loanee Clarke-Salter was sent off for a nasty late challenge on Traore. Boro's Spanish forward then got his marching orders after he appeared to clash with Bryan Oviedo before a corner. Bamford turned smartly and drilled past Lee Camp to draw Boro level early in the second period before former Sunderland midfielder Leadbitter converted a penalty after a foul on Britt Assombalonga. Boro's lead lasted less than four minutes as Wales international Williams struck Oviedo's pass into the bottom corner. But when Bamford rounded the goalkeeper and slammed the ball home with 23 minutes left it looked like the visitors would take all three points. But in the final seconds of six additional minutes McManaman found himself unmarked at the back post and volleyed home Oviedo's corner. "If we want to keep our home supporters with us, to keep them coming, then we have to keep doing what we did today and against Bolton. "We have to go for it and stay in our games. If we do that more often than not we will get points. "It's not easy but it's very doable. There will be a time when we win and it will change the face of everything. "I wouldn't argue about either red card. We were hampered more by losing Jake than they were [losing Traore], even though they lose an exciting player. We lost shape." "We conceded two goals from a long throw and a corner. That is disappointing. "There's really good things about this team I like, but other things they have to really toughen up to. Seeing games out is one of them. "Adama's sending-off was a disappointment, Oviedo has walked round the back of him and poked him in the eye, Adama has raised his hands and shouldn't have shoved him in the chest. Hopefully people will look at it and see it was a reaction to something that shouldn't happen." Match ends, Sunderland 3, Middlesbrough 3. Second Half ends, Sunderland 3, Middlesbrough 3. 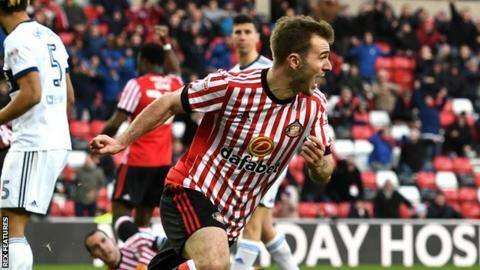 Callum McManaman (Sunderland) is shown the yellow card for excessive celebration. Goal! Sunderland 3, Middlesbrough 3. Callum McManaman (Sunderland) left footed shot from the left side of the six yard box to the centre of the goal. Assisted by Bryan Oviedo with a cross following a corner. Corner, Sunderland. Conceded by George Friend. Attempt saved. Joel Asoro (Sunderland) left footed shot from the centre of the box is saved in the bottom right corner. Assisted by Jonathan Williams. Attempt blocked. Aiden McGeady (Sunderland) right footed shot from outside the box is blocked. Assisted by Callum McManaman. Attempt saved. Patrick Bamford (Middlesbrough) left footed shot from outside the box is saved in the top centre of the goal. Bryan Oviedo (Sunderland) is shown the yellow card for a bad foul. Patrick Bamford (Middlesbrough) wins a free kick in the attacking half. Foul by Bryan Oviedo (Sunderland). Bryan Oviedo (Sunderland) wins a free kick in the defensive half. Offside, Sunderland. John O'Shea tries a through ball, but Aiden McGeady is caught offside. Attempt saved. Callum McManaman (Sunderland) right footed shot from outside the box is saved in the bottom left corner. Assisted by Bryan Oviedo. Attempt blocked. Aiden McGeady (Sunderland) right footed shot from the left side of the box is blocked. Assisted by Bryan Oviedo with a cross. Corner, Sunderland. Conceded by Daniel Ayala. Joel Asoro (Sunderland) wins a free kick on the left wing. Substitution, Sunderland. Aiden McGeady replaces George Honeyman. Substitution, Middlesbrough. Jonny Howson replaces Stewart Downing. Substitution, Middlesbrough. Adam Clayton replaces Grant Leadbitter. Attempt missed. Callum McManaman (Sunderland) right footed shot from outside the box misses to the right following a corner. Corner, Sunderland. Conceded by Ben Gibson. Jonathan Williams (Sunderland) wins a free kick on the left wing. Attempt saved. Callum McManaman (Sunderland) left footed shot from outside the box is saved in the centre of the goal. Assisted by George Honeyman. Hand ball by George Honeyman (Sunderland). Corner, Sunderland. Conceded by Ryan Shotton. Attempt blocked. Joel Asoro (Sunderland) left footed shot from a difficult angle on the left is blocked. Assisted by Lee Cattermole. Goal! Sunderland 2, Middlesbrough 3. Patrick Bamford (Middlesbrough) left footed shot from the centre of the box to the bottom left corner. Assisted by Muhamed Besic with a through ball. Patrick Bamford (Middlesbrough) wins a free kick on the right wing. Substitution, Sunderland. Callum McManaman replaces Josh Maja. George Honeyman (Sunderland) is shown the yellow card for a bad foul. Attempt missed. Patrick Bamford (Middlesbrough) left footed shot from the centre of the box is too high. Assisted by Muhamed Besic. Substitution, Middlesbrough. Jack Harrison replaces Britt Assombalonga.